These are twenty of my personal favorites at this time, and in no particular order. It's always difficult to pick out my all-time favorite images. More often than not it's the emotion I feel for a certain area that is just as important as the image itself. 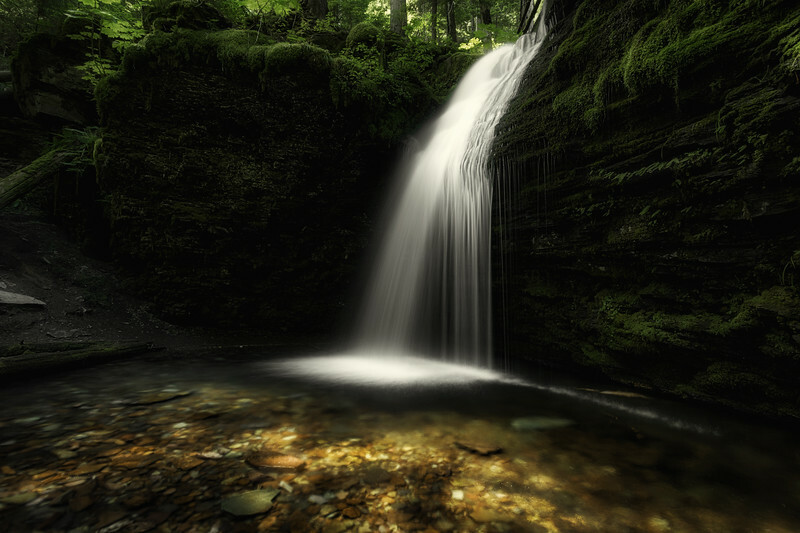 This area is a photographer's dream for waterfalls. All three area's. 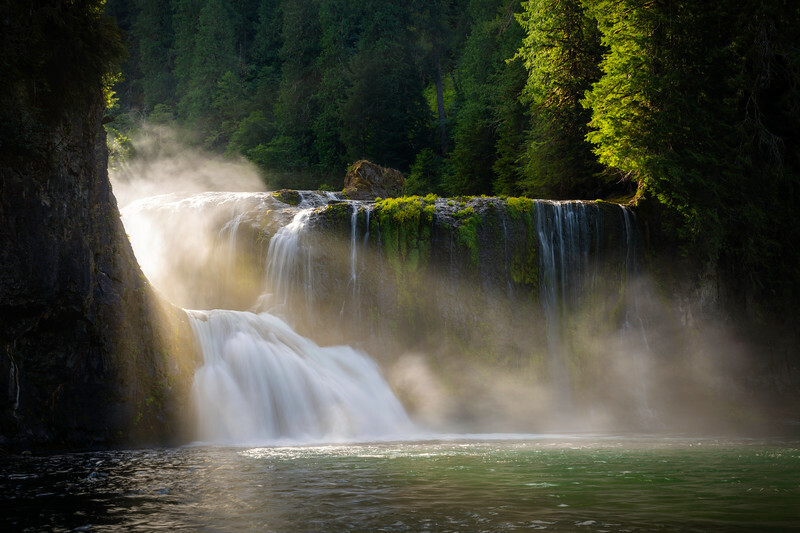 The upper Falls, middle Falls, and the lower Falls are a cornucopia of opportunities. This was taken in the early morning as the mist was slowly disappearing. A magical place! A few days each year with a cloudless sky, the setting sun filters a golden shaft of light that illuminates this 200 foot Sea Tunnel on the Oregon Coast. 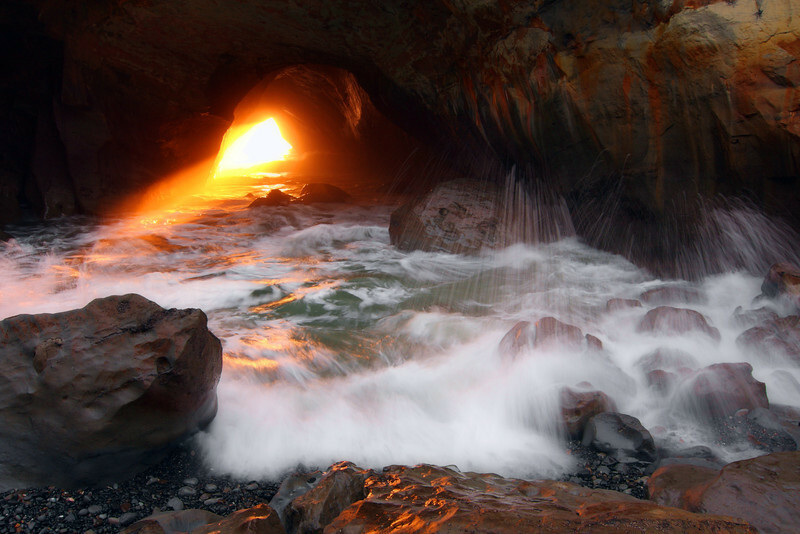 The pounding surf can be felt with each wave crashing into the cave. After a few minutes the golden light slowly fades away. A fresh blanket of snow covers everything on a cold five degree morning. 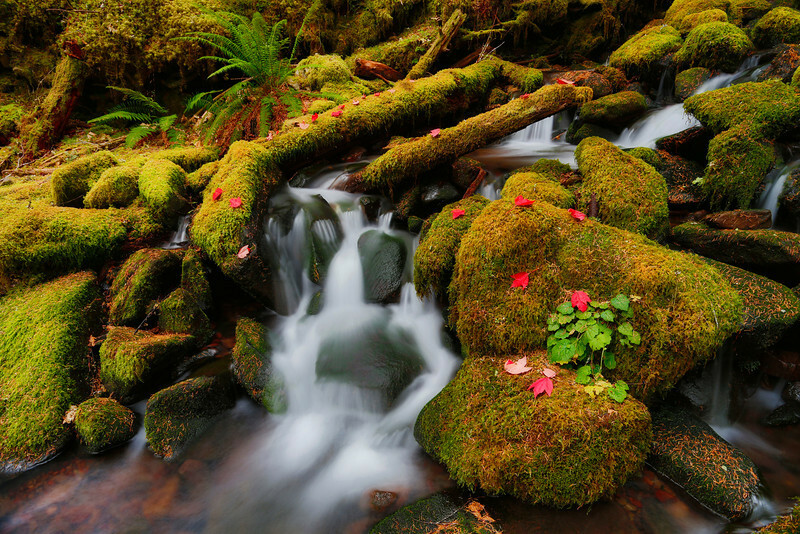 Early morning dappled sunlight illuminates the multicolored river rocks at Shadow Falls, in North Idaho. 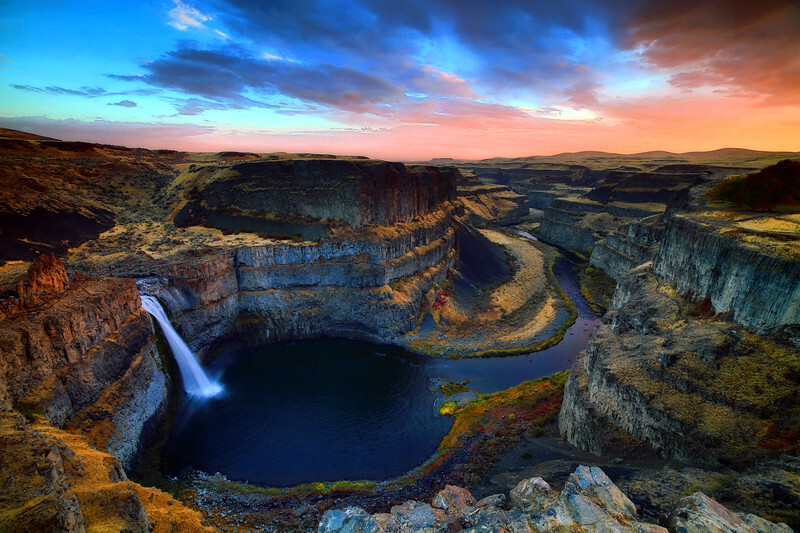 The Ice Age Floods carved the Palouse River canyon and created Palouse Falls and the surrounding canyon. It is the only year round waterfall created by the Ice Age floods that continue to flow today. 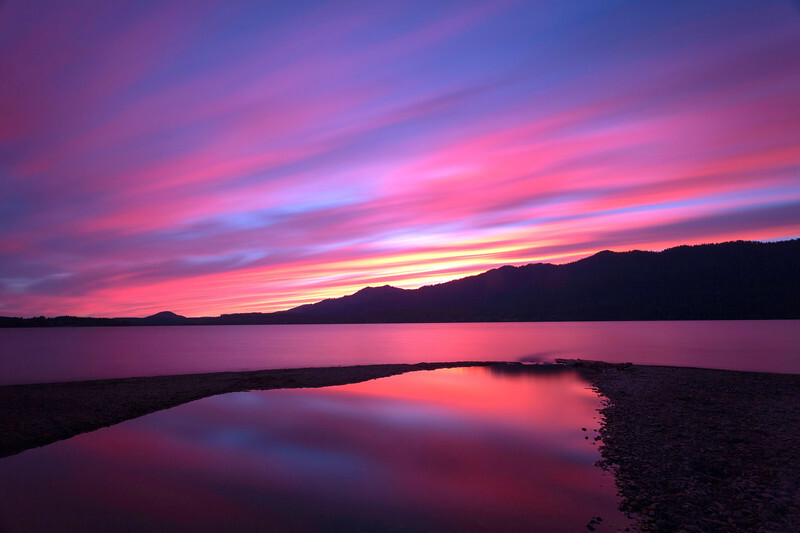 This was taken in Glacier National Park where McDonald Creek flows into Lake McDonald. You find these pebbles in many of the lakes in Glacier National Park. They vary from red to bloody maroon with greens & blues mixed in. The rocks were formed at different eras when glaciers came they broke the rocks into smaller fragments and the rivers washed them into the lakes. 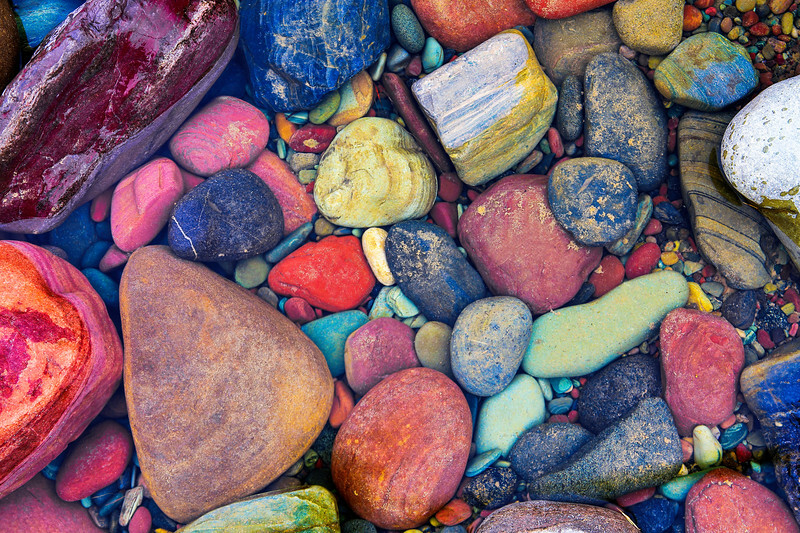 Water erosion rendered them into smooth colorful pebbles. This was taken in April after a very wet Spring. 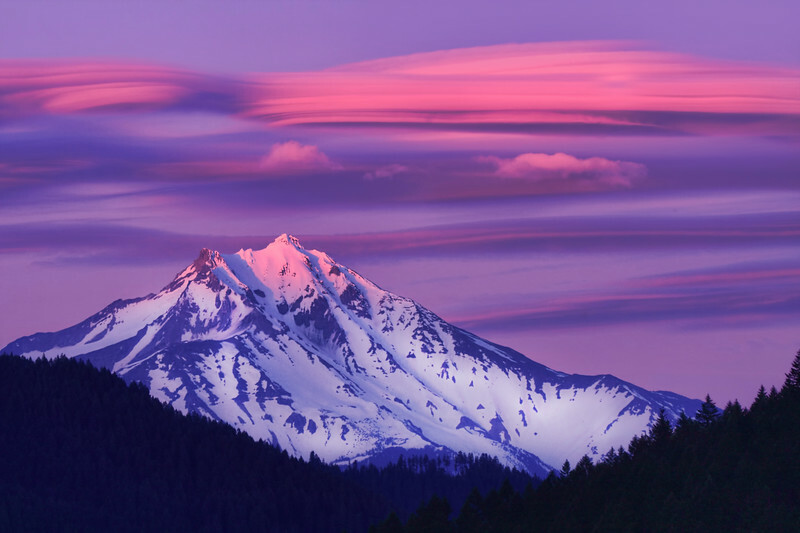 Pink clouds drift over Mount Jefferson to cast the last light on the peak, that tell the end of another day. My wife & I spent a few days exploring wilderness areas & lakes in Banff National Park. 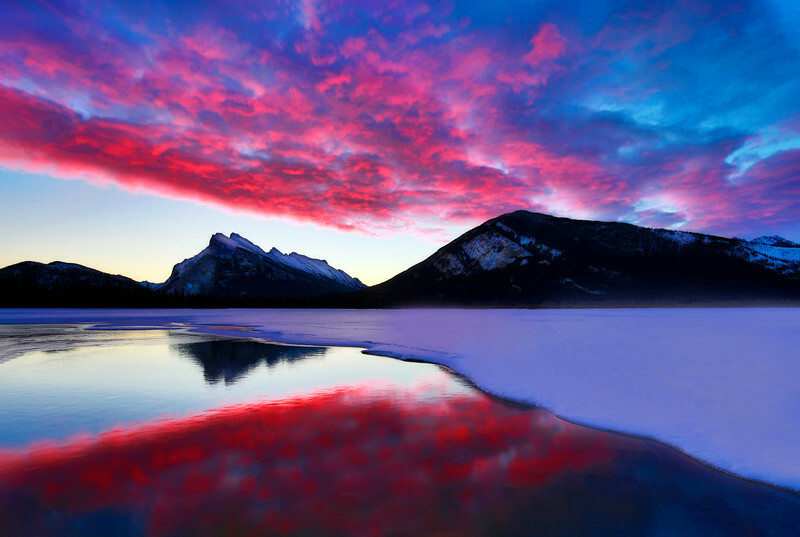 This is Lake Vermillion with Mount Rundle in the background. 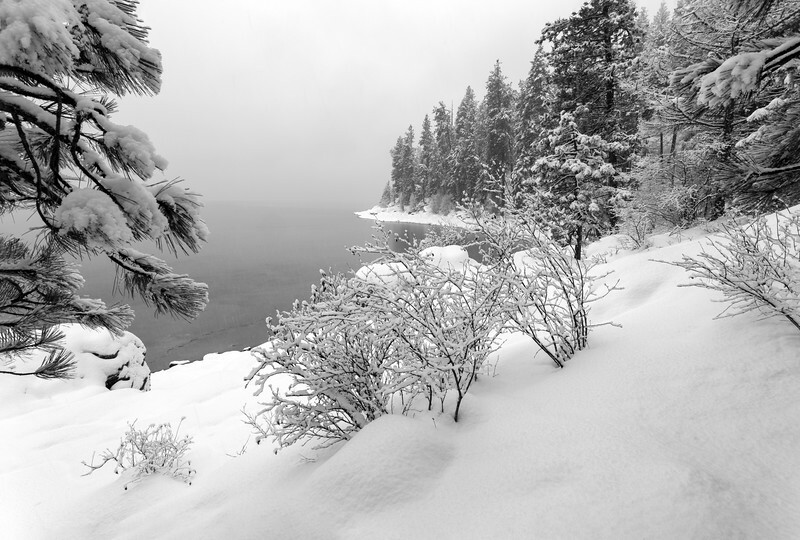 The hot springs seep into the lake that allow a few pools to remain open even though the rest of the lake is frozen. Each morning we would get up before daylight hoping the light would be good. This was taken on the second morning. When we arrived the sky was cloudless and I was pretty disappointed until I looked behind me and noticed the clouds were moving slowly towards the mountain overhead. Lake Crescent is 624 feet deep. It's also known for its brilliant blue waters and amazing clarity. As a child I remember driving around lake Crescent's twisty road with my Mom & Dad, secretly hoping we wouldn't drive off the road into the lake. Having picnic's and camping were part of my earliest recollections. I can recall my Mom telling me to wait for an hour before I could go swimming. I spent my 20th Birthday at this same spot, diving off the dock into it's frigid waters, surfacing, whilst hollering how cold it was to my friends. The scene before me was mesmerizing as it had not changed since my childhood. The morning I shot this photo it was a quiet morning with no one around but myself. It was a time to reflect about my childhood memories, and the great times spent here . "Each year I return, it's like visiting an old friend." Hazen and Oz stroll through an Autumn Meadow two blocks from home in Coeur D Alene Idaho. Having been born and raised in Port Angeles I know my way pretty well around the OP. The last time I photographed this lake was 37 years ago. I just never made it back. This is a 120 second exposure that smoothes the lake as well as the clouds. The camera records movement that we can't see with our eyes. 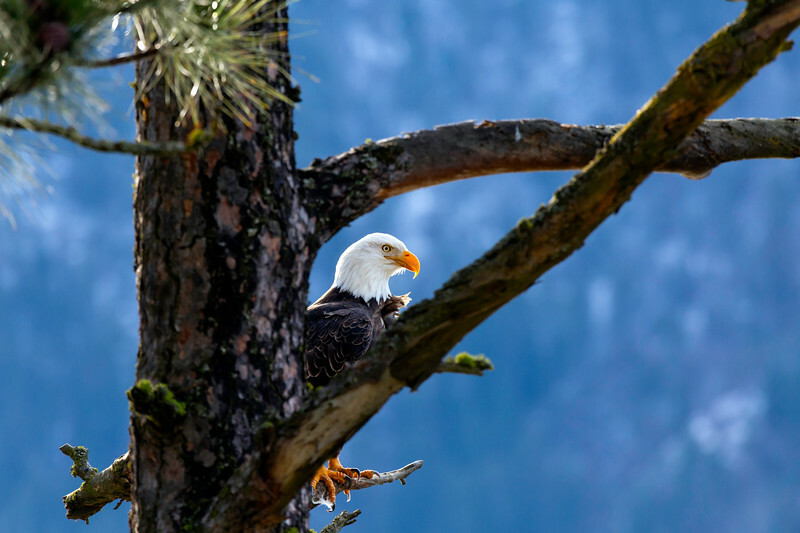 An adult Eagle gazes over Lake Coeur D Alene for his next meal. This was taken towards the end of April after a freak snowstorm blew in the night before. Stanley Idaho is on of the coldest areas in the lower 48. 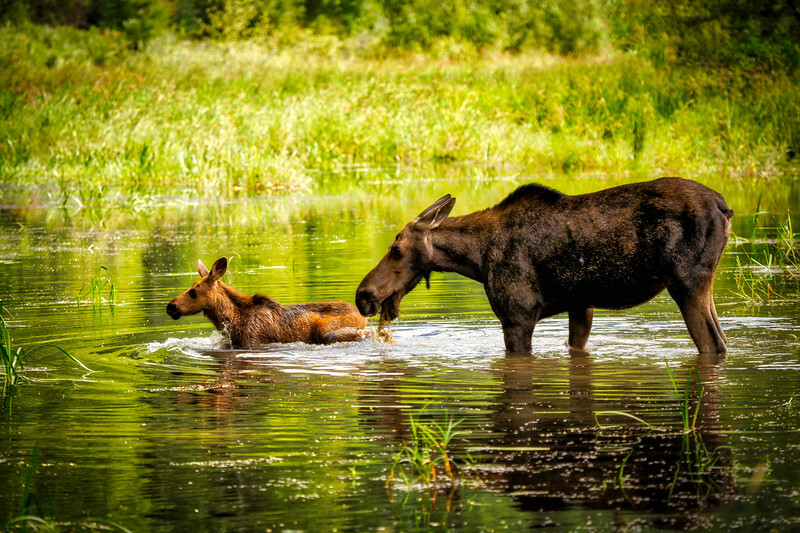 A Mother Moose gently guides her calf safely to the other side of the Coeur D Alene River. We were camping at Ollalie Lake near Mt. Adams, and had taken our usual morning walk after breakfast down to the lake. 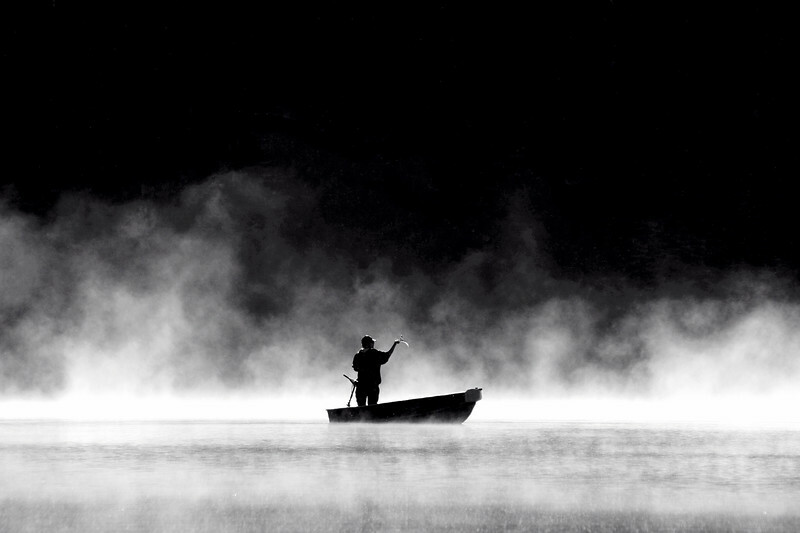 We noticed the mist rising above the lake with the fisherman in his boat. I ran back to camp to retrieve my camera. He was quite a ways away so I used my long zoom and shot quite a few frames. I got lucky with this particular shot as he was about to cast his line. This is the Upper Lewis River Falls. 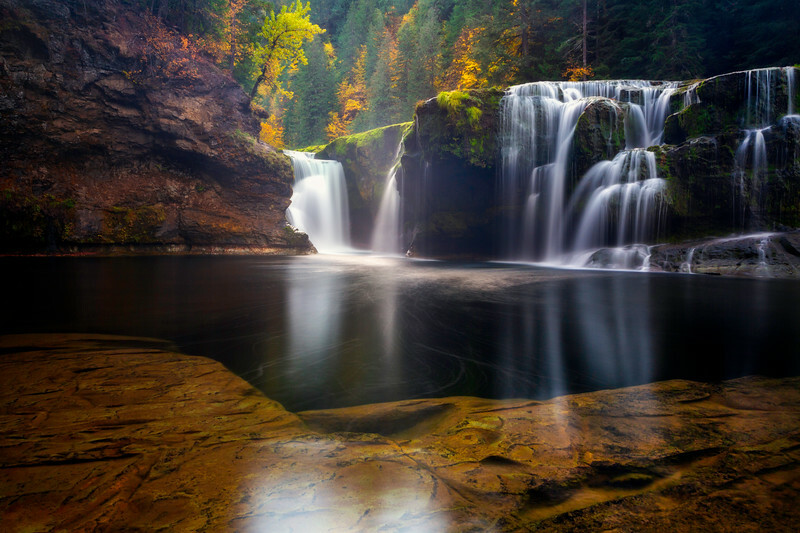 The lower falls is a favorite with many photographer's, "including Me." On this outing I wanted to be at the base of the falls as the sun was lighting up the top of the flow. My wife and I were vacationing in Idaho. It was raining so hard I could barely see the road. We came upon a small town with a cemetery near the edge of it. My wife noticed the rainbow and excitedly told me to pull over and grab my camera. 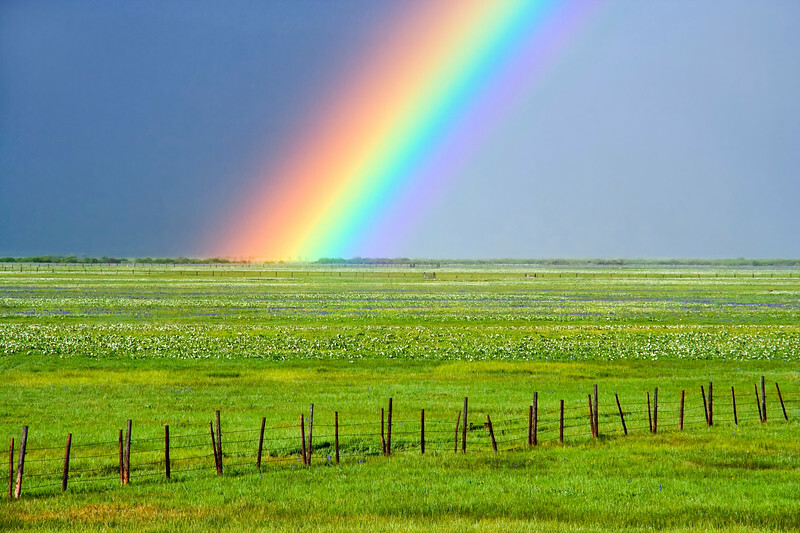 We sprinted across the field, knowing that the Rainbow wouldn't last for long. I think I shot three or four frames before the rainbow slowly disappeared. We didn't find a leprechaun with a pot of gold at the end of the rainbow, but we had a great time. 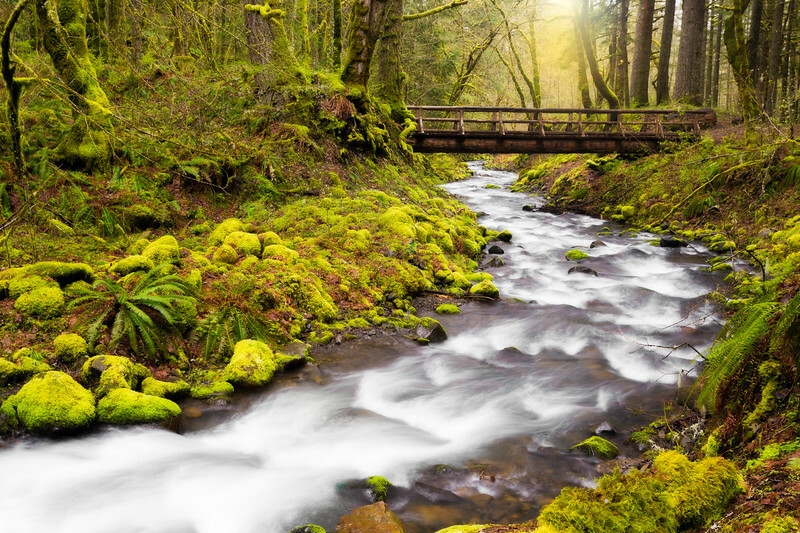 This small creek is located in the Olympic National Park near Solduc Falls Solduc Falls is always the main attraction, however I enjoy visiting this little creek each year. 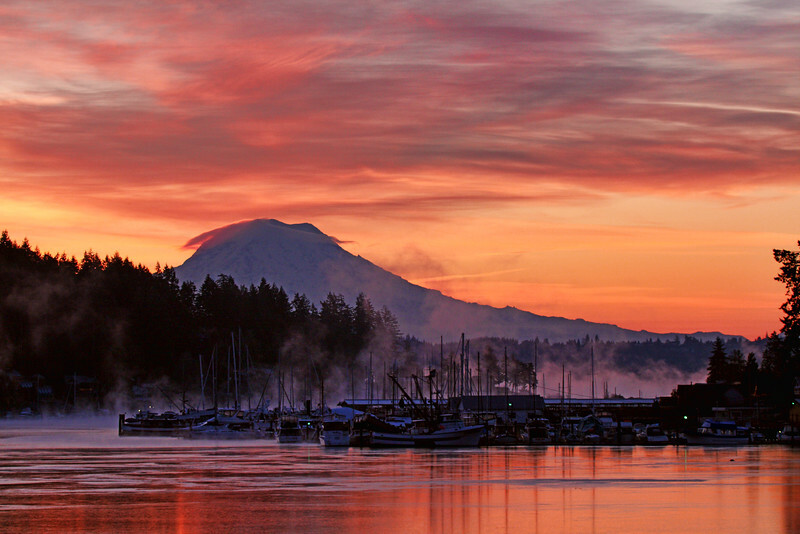 This is the Gig Harbor boat marina with Mount Rainier as a backdrop. The morning I shot this, December 9th 2009, it broke an all-time weather record, for being the coldest day ever recorded in the Greater Puget Sound area. I couldn't adjust my camera with gloves on, so when I returned to my truck my fingers felt like they were going to break off and shatter on the ground. 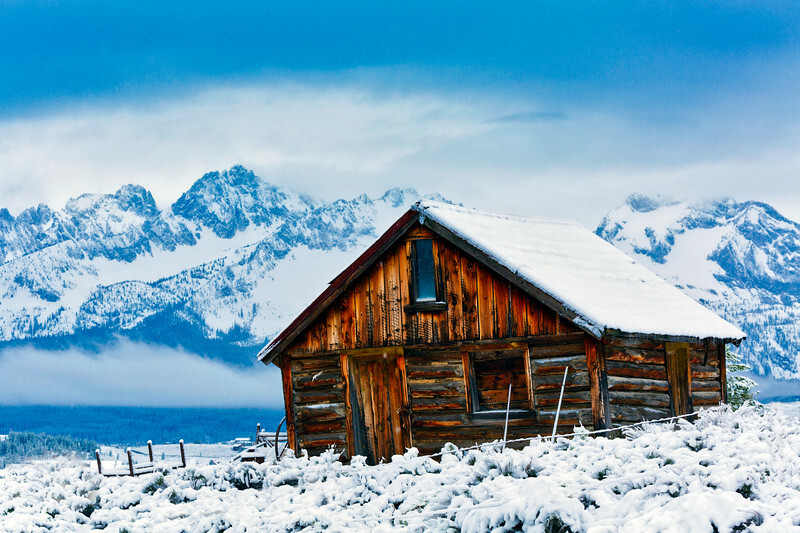 I'm usually excited about capturing scenes like this, but It was miserable, until I arrived home to a hot cup of coffee.